Buenos Aires, Argentina: The United States and China reached a 90-day ceasefire in a trade dispute that has rattled financial markets and threatened world economic growth. The breakthrough came after a dinner meeting on Saturday between President Donald Trump and Chinese leader Xi Jinping at the Group of 20 summit in Buenos Aires. Trump agreed to hold off on plans to raise tariffs January 1 on $200 billion (Dh734 billion) in Chinese goods. The Chinese agreed to buy a “not yet agreed upon, but very substantial amount of agricultural, energy, industrial” and other products from the United States to reduce America’s huge trade deficit with China, the White House said. The truce, reached after a dinner of more than two hours, buys time for the two countries to work out their differences in a dispute over Beijing’s aggressive drive to supplant US technological dominance. In a long-sought concession to the US, China agreed to label fentanyl, the deadly synthetic opioid responsible for tens of thousands of American drug deaths annually, as a controlled substance. And Beijing agreed to reconsider a takeover by US chipmaker Qualcomm that it had previously blocked. The White House announcement framed a victory for Trump and his unflinching negotiating tactics, securing a commitment from China to engage in talks on key US economic priorities, with little obvious concession by the US Notably, however, the White House appears to be reversing course on its previous threats to tie trade discussions to security concerns, like China’s attempted territorial expansion in the South China Sea. The Trump-Xi meeting was the marquee event of Trump’s whirlwind two-day trip to Argentina for the G-20 summit after the president cancelled a sit-down with Russian President Vladimir Putin over mounting tensions between Russia and Ukraine. Trump also cancelled a Saturday news conference, citing respect for the Bush family following the death of former President George H.W. Bush. Trump has imposed import taxes on $250 billion in Chinese products — 25 per cent on $50 billion worth and 10 per cent on the other $200 billion. Trump had planned to raise the tariffs on the $200 billion to 25 per cent if he couldn’t get a deal with Xi. China has already slapped tariffs on $110 billion in US goods. Under the agreement reached in Buenos Aires, the two countries have 90 days to resolve their differences over Beijing’s tech policies. If they can’t, the higher US tariffs will go into effect on the $200 billion in Chinese imports. 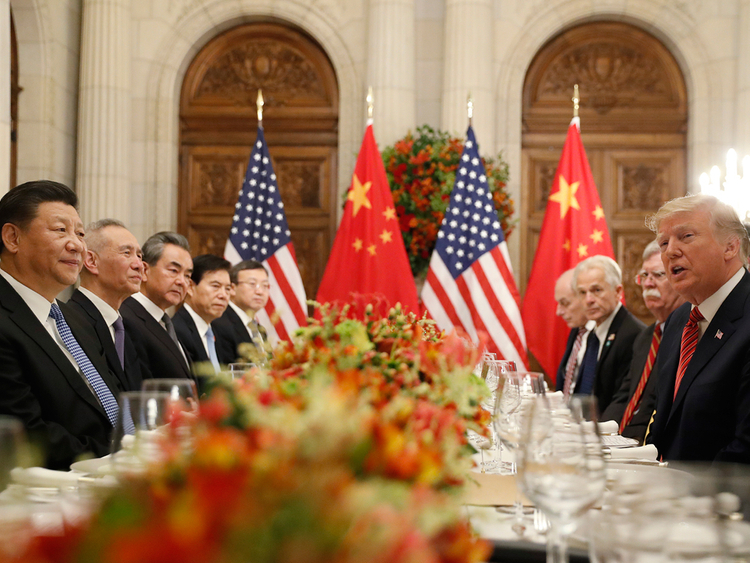 US officials insist that the American economy is more resilient to the tumult than China’s, but they remain anxious of the economic effects of a prolonged showdown — as Trump has made economic growth the benchmark by which he wants his administration judged. A full-blown resolution was not expected to be reached in Buenos Aires” the issues that divide them are just too difficult. Growing concerns that the trade war will increasingly hurt corporate earnings and the US economy are a key reason why US stock prices have been sinking this fall. Joining other forecasters, economists at the Organization for Economic Co-operation and Development last week downgraded their outlook for global economic growth next year to 3.5 per cent from a previous 3.7 per cent. In doing so, they cited the trade conflict as well as political uncertainty. The US and China also made progress on the regulation of fentanyl, which is 50 times more powerful than heroin. US officials for years have been pressing the Chinese government to take a tougher stance against fentanyl, and most US supply of the drug is manufactured in China. China’s decision earlier this year came amid a period of heightening tensions between the US and China over trade and intellectual property issues. In other developments, Trump announced aboard Air Force One on his return to Washington from Buenos Aires that his next meeting with North Korea’s Kim Jong-un would likely happen in January or February. He said there were three sites under consideration, but he declined to name them.